I won't be going to your grave tomorrow. I'm sorry, but I know you aren't surprised. I never go there. I'm not sentimental like you, and I know you don't hold that against me. (And please don't say I'm just like my daddy. The truth hurts.) I never understood the point of standing in an open field of buried strangers and talking to the dirt and sky. It doesn't comfort me in any way to see your named etched in stone with those two finite dates below it. Instead of bringing me any kind of peace, it always smacks me in a "holy-crap-she's-really-gone" kind of way. (Sorry, I know you hate for me to say "holy crap".) So, instead of driving to the place where your spirit never lived and commemorating that forgettable day, I decided to write you this letter to let you know what you've missed since you've been gone. First of all, you would be so proud that I finally let my hair grow out. Seriously! I did! You always told me how you liked it better long, but I was too damn lazy and impulsive on bad hair days to stick to it. How many times did I chop it off? How many times did you beg me not to chop it off? Well, I sucked it up, hid the scissors, and I think you would approve. Jacob even told me he hated it because it makes me look like a teenager. HELLO! I guess that means I'll never cut it again. And speaking of Jacob...I wish you could see him now. He has grown into such a handsome young man. He's in middle school now. Can you believe so much time has passed? When you last saw him, he was a little kid who couldn't stand for me to touch his hair or dress him in clothes that matched. Now, he's up before the birds, making sure every hair is in place and that his clothes look just right. And...he has contacts. I know!! It makes my skin crawl, too, but he has been so mature in taking care of them because he knows that I don't do eyeballs. The only thing about your "sweet baby" that hasn't changed is the relentless teasing he gives to Hannah. You and I both know that deep down...he thinks she's really kind of cool. And, Hannah...she talks about you all the time, you know. She tells me that she misses you, and I want her to miss you. I want her to remember that you shared a deep love of all things sugary and sweet. I want her to remember sneaking into your bedroom at night and eating jelly beans with you. I want her always know that you played Tickle Monster with her from the chair because you weren't able to get on the floor with her or chase her around like other grandmothers, and she was just fine with that. I want her to remember rocking with you and singing songs. (She has your beautiful singing voice, too.) You left us when she was only three years old, and I'm scared as hell that the dim light shining on those memories of you is becoming weaker, soon to fade out altogether. I'm doing what I can to keep you here, to keep a little girl's image of her beloved Granny in tact. It's so hard because time marches on. I guess I should bring up the fact that our crazy, psycho dog, Pippy, passed away. I have been secretly praying that all dogs do NOT go to heaven, because I know how much you couldn't stand that mangy mutt here on Earth. I would hate for her to be barking at the wind, growling at the swaying trees and trying to sit on your lap for eternity. I miss you every day, so please forgive me for not visiting tomorrow. I'm taking a lesson from you and having a Girl's Day Out. I think you would approve of some pampering and lunch instead of having a pity party. You always did love the girly stuff, didn't you? Oh, and by the way...all those times you told me that you hoped I would have a kid of my own just like me that drove me crazy just like I did you? Well...thanks for the heads up, Mama. She's here. Oh my God!!!! Lynda! You have the wonderful gift of being able to make me laugh aloud and sob! Thank you for sharing this wonderful letter. I am so terribly sorry for your loss1 I am so thankful to have both of my parents....to drive me crazy! I think you are an incredibly talented person. Tonight I read this blog and the one about your son's field day (bonus for me, I learned a new word today). In the span of a few minutes I laughed and cried with the words of a stranger. You have skill. I don't know what your life goals are...but I think you could write for a sitcom, or a book. I'll tune in either way. I want to thank you. 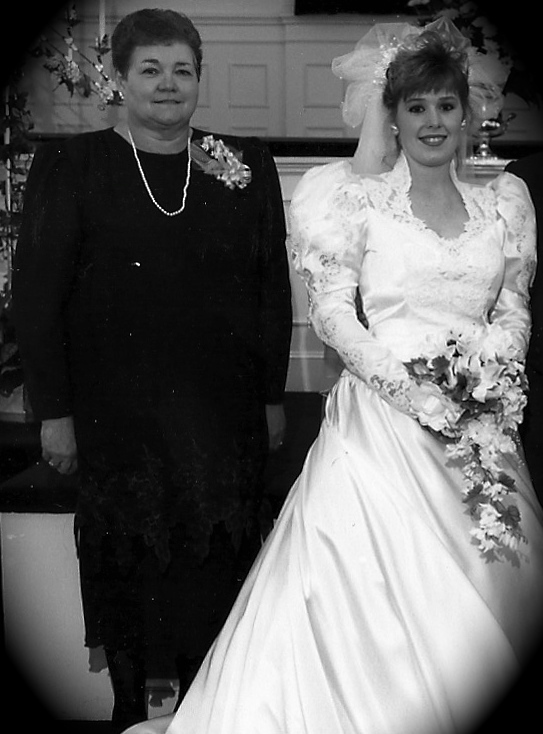 My grandmother, and person I held most dear in my entire life, has been gone for 3 1/2 years (3 weeks before the birth of my first child.) After reading this blog, I no longer feel guilty about never visiting her gravesite. I know she would want me to keep living and doing what I'm doing, and is still here with us every day. @Mollyblogging...Thank you SO much. You made my day. Lynda, Just want to reiterate what everyone has said about this and say that I love your writing. This made me laugh and cry. You are a constant source of inspiration to me. I will be getting my "blog on" soon and yours has given me much needed direction. Happy Mothers Day. The things you say make it more OK to think the things I do. Like you I very rarely visit my Mama's grave. Shes not there and I feel closer to her in my yard tending flowers than anywhere else. Talk to her every day and shes in my heart forever. Can't wait to see her!